22.5 x 15.75 inches. Printed on paper. Flat map, tubed for shipping. Perfect for home, business, or school, this United States Interstate Highways wall map shows the Interstate Highway System of the United States, along with other important Federal and state highways. Details included on this wall map include: international and state/provincial boundaries; freeways, tollways, and other major roads; cities and towns; time zones; and all National Parks in the United States. Insets of Alaska and Hawaii are also included on this map. Special features include colored relief and a white decorative border. Created by Globe Turner, one of the leading producers of map products in the USA. 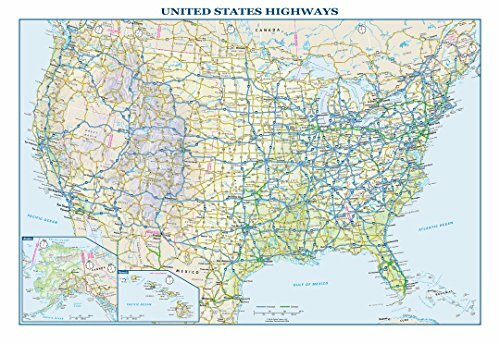 Perfect for home, business, or school, this United States Interstate Highways wall map shows the Interstate Highway System of the United States, along with other important Federal and state highways. Details included on this wall map include: international and state/provincial boundaries; freeways, tollways, and other major roads; cities and towns; time zones; and all National Parks in the United States. Insets of Alaska and Hawaii are also included on this map. Special features include colored relief and a white decorative border. If you have any questions about this product by Globe Turner, contact us by completing and submitting the form below. If you are looking for a specif part number, please include it with your message.